Hi, we’re glad to publish this article by one of our community members, Mason N. You might remember his striking article-testimony about the SPD industry. Now he chose to send us an article about electrical conduits. So To PVC or not to PVC? Let’s read what he has to say. “To PVC or not to PVC? That is the question”…Pardon the horrible pun but we Engineers not authors and if a pun doesn’t make you groan in pain it’s not a good one. In this post I’d like to share some items for consideration when it comes to specifying and using different types of electrical conduit for industrial/ municipal applications as well as my approach in these situations. Protected RGS. This is RGS or GRC that is either factory coated with a PVC outer cover and interior coating, or has been wrapped with polyvinyl tape. Secondly I’d like to define three types of circuits because the application is a direct factor in choosing a conduit. What is the risk of damage to the conduit? Let’s start with the big questions to ask. What is the risk of damage to the conduit? Is it exposed? What kind of environment is it exposed to? What is the anticipated lifespan of the facility? As I primarily deal with municipal (public) system reliability and integrity are my primary concerns. Indoors, for power and control circuits, I think metallic conduit for all exposed work is a must simply for the safety of the installation. I even go so far as to say that EMT can only be used at heights where it is unlikely to be damaged, for example above the level of a forklift. Additionally, in areas where the conduit is exposed to a corrosive environment such as a room storing chlorine gas, I will only use protected RGS. ’m sure many of you can attest that rooms where all chemical storage is enclosed and people can freely move around without protective gear will still show signs of corrosion after a number of years. For non-exposed areas there are a myriad of non-metallic options beyond PVC. That said I still like to use EMT or FMC. Outdoors the same basic questions apply. I don’t like PVC outdoors as UV from the sun makes it brittle and fiberglass will “bloom” over time. What about the transition points? Any time I enter or exit earth ground I want protected RGS to prevent corrosion. The same applies for conduits entering and exiting concrete. Concrete has a moisture content and I think the cost of PVC tape is a great insurance against corrosion. Additionally, conduits entering or exiting concrete are typically exposed and as such I want rigid conduit. 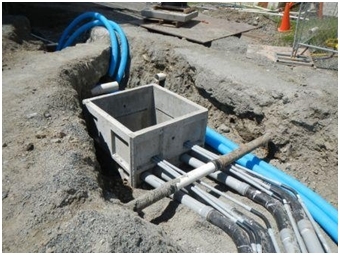 A good exception is at the penetration to an underground vault. Here the risk of damage is less and as there generally aren’t fittings a PVC penetration makes the most sense. How about below grade installations? Let’s talk about below grade installations. Here again I think the bulk of consideration goes to possibility of corrosion with a nod to potential damage if in an area prone to be dug up because of other utilities or process piping in the area. For power and control I want the afore mentioned RGS to transition from above grade to two feet below grade, after that I use PVC-40 for long straight runs. Another unique aspect to my underground approach is that I require RGS elbows for all bends over 30°. I have seen too many conductors damaged coming around PVC corners and I’ve even seen conductors burn /cut into the walls of PVC corners. It’s the old saying, once bitten twice shy. In this regard I think fiberglass elbows would be another alternative to PVC but I’ve not had time to research them yet. Given my concerns about corrosion and time it’ll come as no surprise that all underground RGS conduits need to be protected RGS conduits in my opinion. I don’t mind half lap PVC tape at the straight pipe transition points from below grade to above grade but I want my elbows to be factory coated PVC to ensure there are no missed spots. All of my discussion above has been in reference to what I call power and control circuits but if the conduit is an instrumentation conduit, the integrity of the signal trumps all other concerns for me. I want my process to run as reliably as possible so I require that all instrumentation be in continuous metallic conduit. This has led to some heartburn and some long specifications as that might mean several types of metallic conduit are used on a single run, for example one run could have portions of RGS, protected RGS, and LFMC from starter to field installed motor. The other situation where I want continuous metallic conduit is when the loads are non-linear, namely those where a motor is connected to a variable frequency drive (VFD) and the ballasts of UV systems. While the ballasts of room lighting are technically non-linear it is not process critical and so I lump that into the general power category. Hopefully my approach has given you something to think about in your own selections. I welcome feedback in the comments to hear of your own experiences as everyone has a different emphasis and has found their own balance point. or copy this trackback: http://engineering.electrical-equipment.org/safety/to-pvc-or-not-to-pvc-that-is-the-question.html/trackback from your own site.